The Shaker stool is finished and ready to sit on, but I can’t bring myself. Yet. I’ll get over it. But I love my stool. After lopping off the extra material where the tenons and braces stuck out with a saw, I evened (is that a word?) everything up with a plane and sanded it with 220. I gave it two coats of diluted clear shellac. Sanded with 320, and gave it one more coat with undiluted shellac. I rubbed it with wax and 0000 steel wool and it feels amazing to the touch. Very silky smooth. There are a few gaps on the diagonal braces. They all fit really tight structurally, but here and there I have a little gap. Those braces are the hardest part in my opinion. 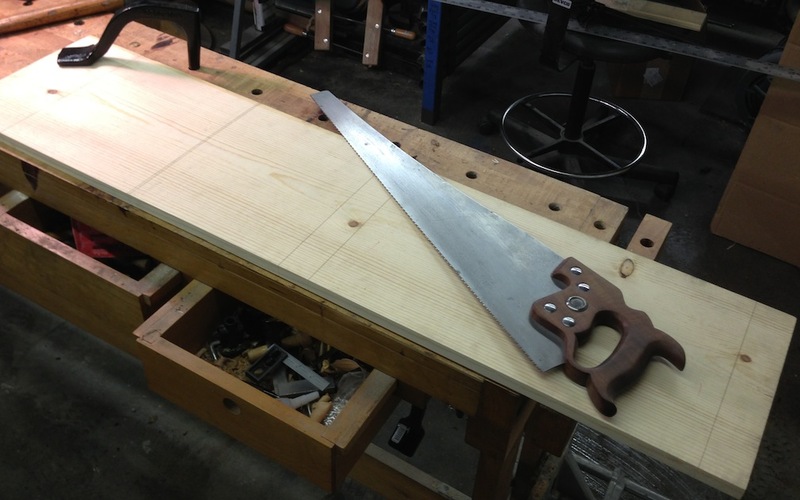 Next time my plan is to lay out a template with the notches and end bevels – allowing for a little overhang for trimming. Then I can mark out all four braces, and use the template to check my work as I saw and pare the notches. 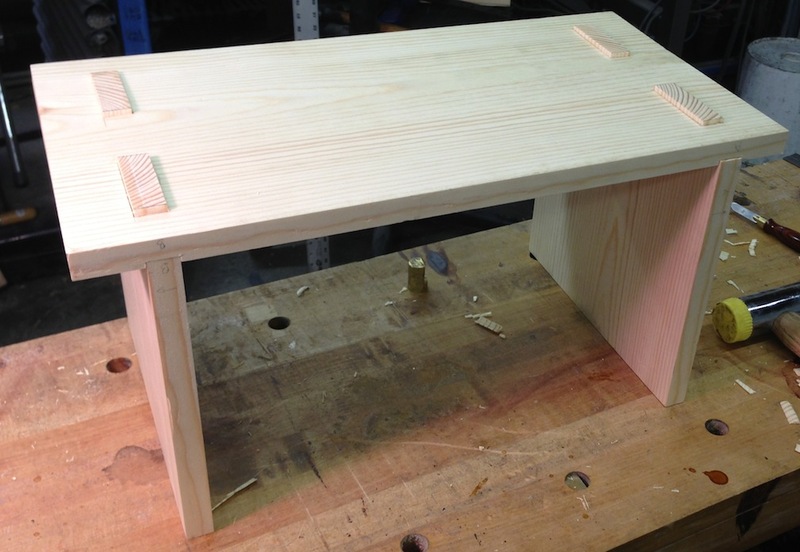 Recently Ralph at the Accidental Woodworker did a blog post on making a Shaker Stool based on a class he took with C.H. Becksvoort. 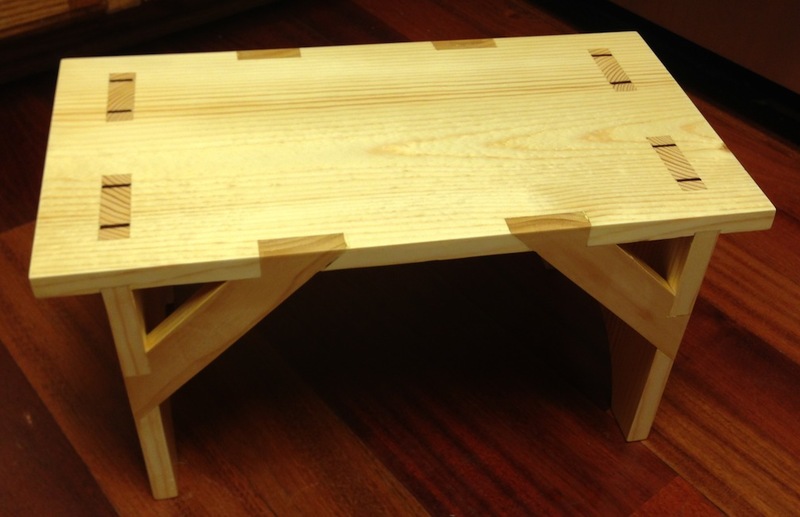 Fine Woodworking also published an article on the same stool project this month. It looked like a fun project (and it had better be, because I don’t want to tell anyone I’m having trouble enjoying my stool). I had some left over white pine from making the tool chest for my my brother-in-law Jay, so I thought this would be a good skill-practice piece. It’s not a great piece of wood, even allowing for the lousy nature of this genre of wood to begin with. It is badly cupped and has a slight twist. There isn’t enough wood here to plane it straight and flat, unles I plan to make paper airplanes out of it. Now that I have my excuses properly established, we can move on. I knifed in all of my cross cuts, avoiding the knots as best I could. You probably can’t see it clearly in the photo, but for one of the cuts I knifed in a double line to allow for the saw kerf. I got this trick from Paul Sellers, and it seemed to work well. I eliminated a lot of tear out between the adjacent pieces and gave me lines to plane both parts to. After cross-cutting I also had to rip the boards to width, which let me get rid of all of the edge knots but one. Just kidding. This bench is a lot more complex than that. In fact, the main reason I wanted to make it was for the practice cutting joints. 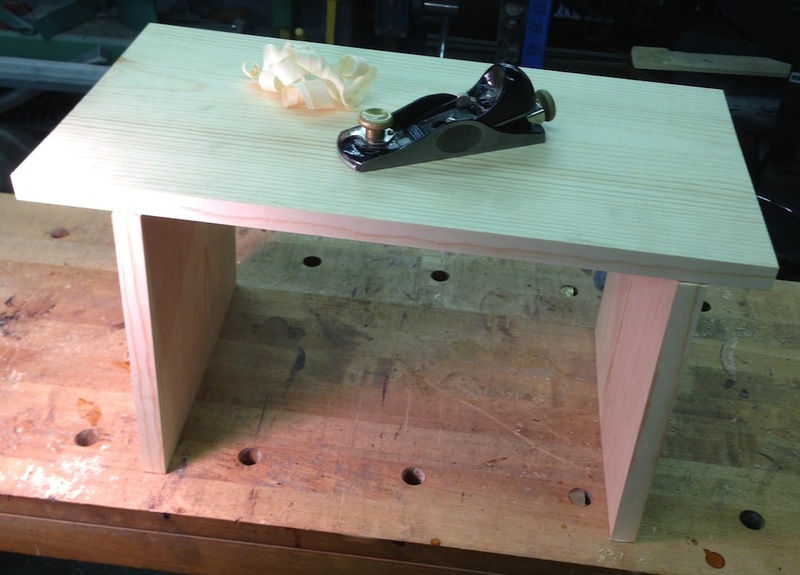 The first order of business was to layout and cut two dados across the bottom. I screwed up the first one and made it too wide. I’m not 100% sure how I did that, but it probably boils down to being careless. I used a marking gauge to layout the outside edge of both dados, and pared up to this line creating a Paul Sellers’ “Knife Wall”. Then I fit the leg against it, and knifed in the other side. Done properly this should give a tight, accurate dado. In this case I’m one for two. In Baseball I’d be batting .500 and and could get a MLB contract, in woodworking that puts me squarely in the “rank amateur” category. Think about that. After cutting the two dados I needed to cut two through mortises in line with the dados. 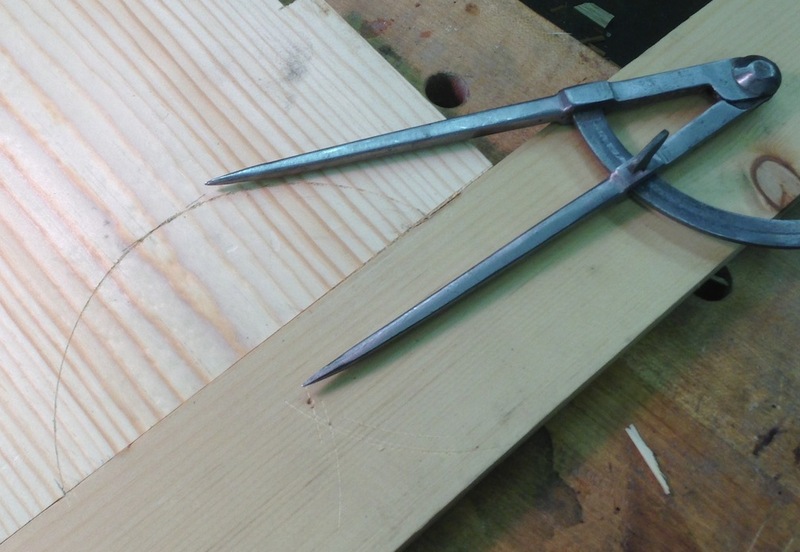 I cut the tenons on the legs first, then used this to transfer the locations of the ends of the mortises. I used the marking gauge to lay out the outside edge of the mortises on the top, and just gauged the width using the actual tenon. It worked out pretty well. I didn’t try to “chop” the mortises using a chisel across the narrow width – I was afraid it would just split the wood and make a frayed mess. Instead, I removed the waste in the same way I did the dados. I chiseled across the grain and pared up to it to create “knife walls”. I worked from both sides, and the waste mountain in the middle just dropped out nicely. So far, so good. 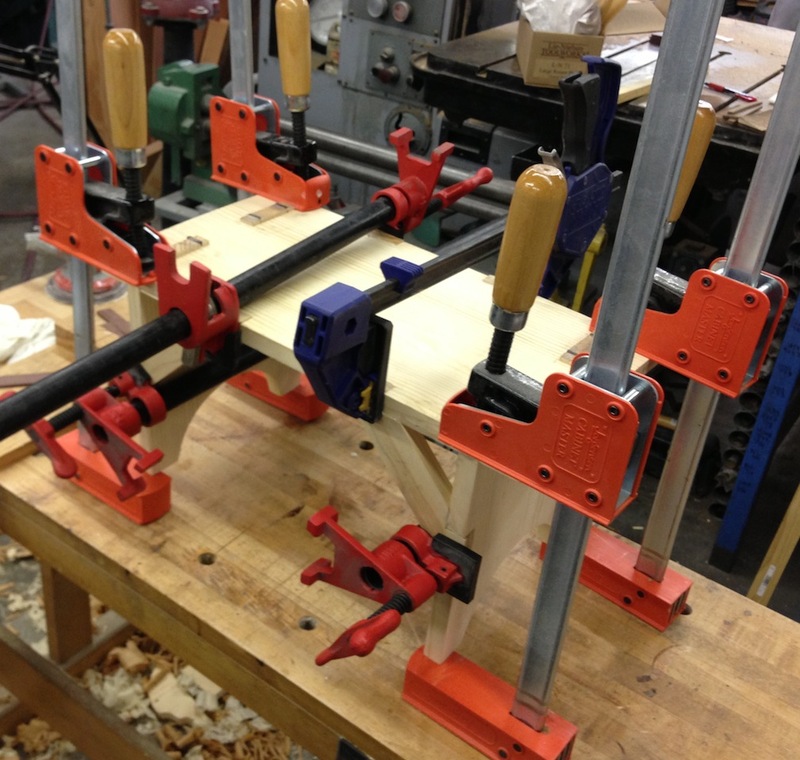 One loose dado, one tight dado and four tight mortises. Marking out the arch for the legs was simple, although cutting with a coping saw was a near disaster. The cut wandered all over the place like the new Hobbit movie, “An Unexpected Journey”. I ended up doing a lot of rasp work to get the curves right. I need a better saw for cutting curves! 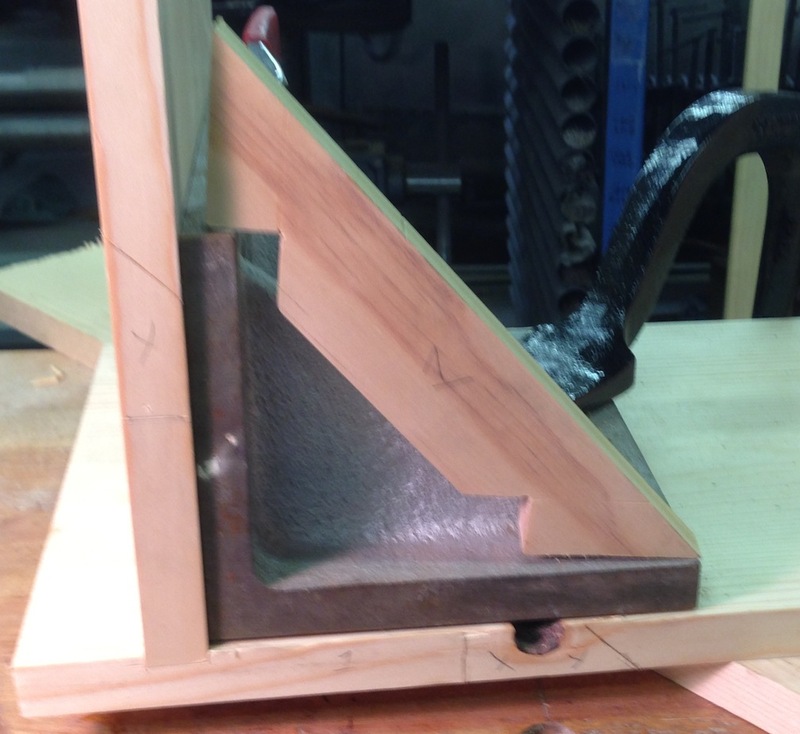 The next step was really time consuming – cutting and fitting the corner braces. I followed the instructions in the magazine, cutting all four to length first. I think it would be easier to hold on to them if I left them long at this stage, but the instructions for laying out the notches are based on them being the right length. 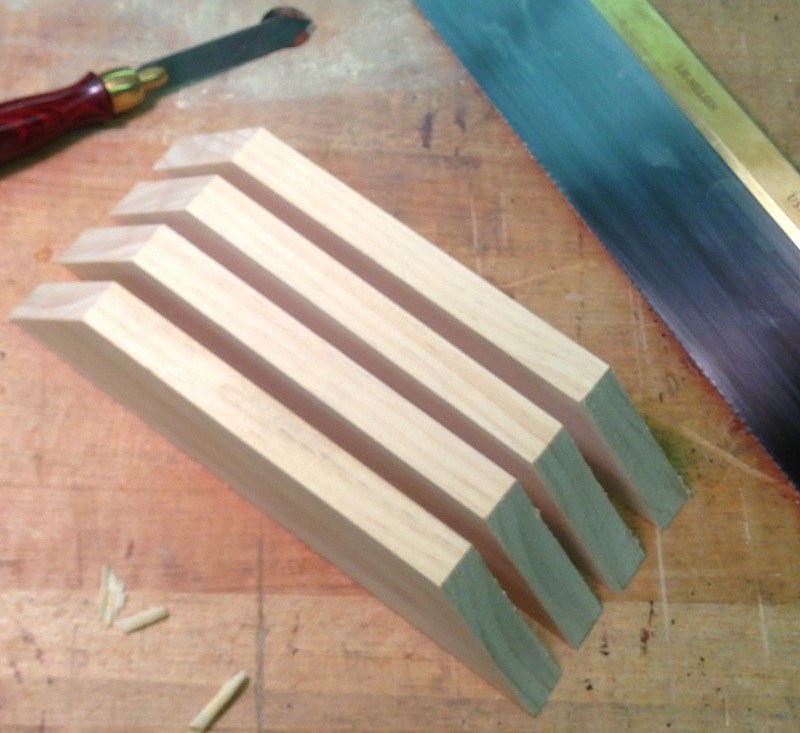 This approach worked OK, my biggest problem was getting the notches cut, squared and evenly spaced. My saw cuts were all a little off, and having a longer length at that stage would probably make it simpler to hold them in the vise and get a good approach with the saw. So I did a lot of paring with the chisel, to get the cuts square to the faces of the brace, and to create a square inside corner. In the end I was mostly successful, but there are a few gaps in the assembled bench. 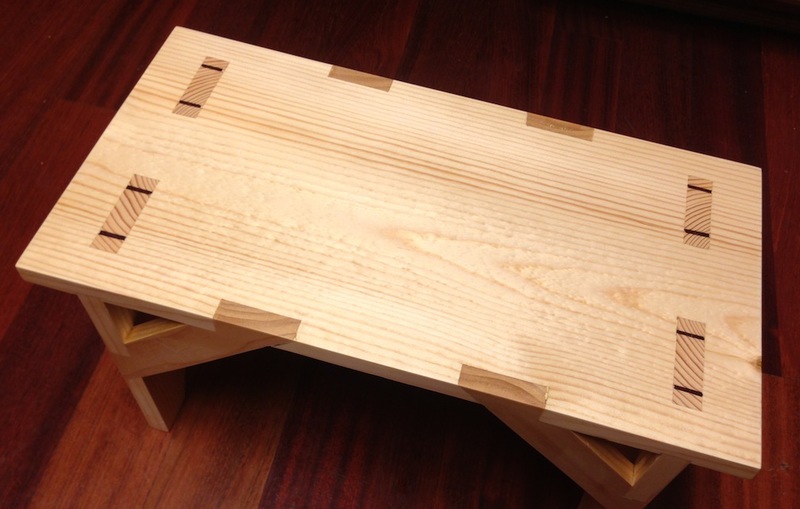 It reminds me of my first attempt at dovetails, and not in a good way. To fit the angle braces to the bench I dry assembled the legs and top and clamped them together against a cast iron angle plate. These things are very accurate for woodworking – even the cheap ones that you can get from Harbor Freight and Enco. I picked up several from Enco on sale a few years ago for maybe $20 each. 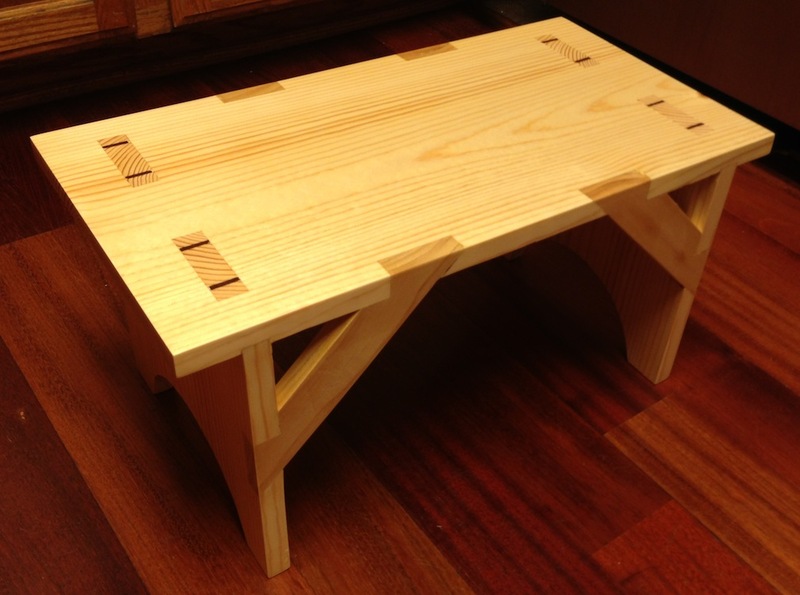 I’ve used them to make machining fixtures for the CNC mill, and on occasion to help out with a wood project like this. I eyeballed wach brace, and knifed in the cuts. I sawed the shoulders and split out the waste, paring up to the depth layout line I made with my marking gauge. I set the gauge slightly shallower than the thickness of the braces so I could plane them to be flush. I caught a lucky break in that the one edge knot I was stuck with is eliminated by this brace! Last thing yesterday I glued up the assembly. I used some scraps of Purpleheart to wedge the tenons. I wasn’t going to clamp this, but one of the angle braces wasn’t seating as tightly as the rest, and even with the wedges in the mortises the top still had a slight tendency to cup. So I started adding clamps, and ended up with something kind of scary looking. I’m going to head out to the shop in a bit and remove the clamps, plane off the protrusions and decide if the assembly is good enough for a coat of shellac. If not I may end up trying out some milk paint on this project. Either way, it will be off my bench today so I can get back to work on my workbench project. PS: and yes, that is a Lie-Nielsen box hiding in the background. Santa was good to me this year, more about that another time.